Instructors in Kellogg Community College’s Criminal Justice and Emergency Medical Services programs received instructor training on new FAAC Emergency Driving Simulators Nov. 18 through 20. The 24-hour train-the-trainer program taught the instructors how to use the driving simulators as part of a larger emergency driving program. 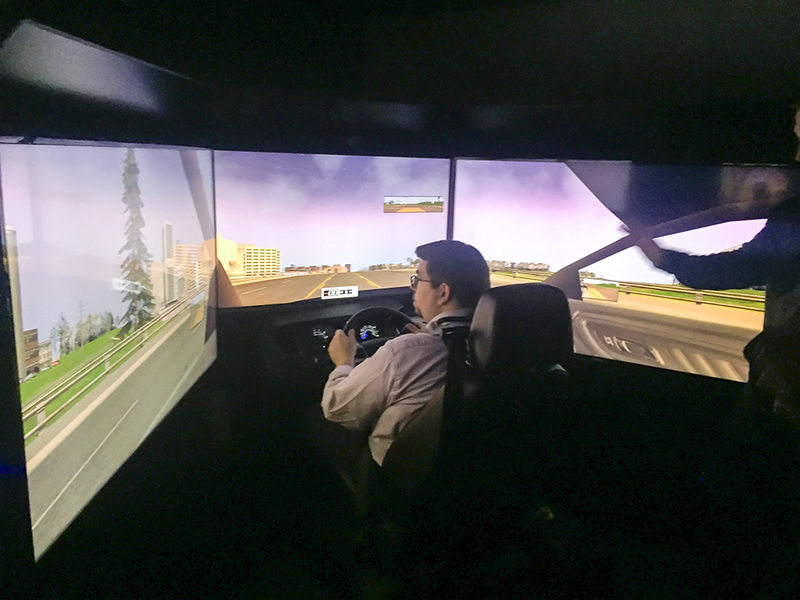 The goal was to incorporate driving simulation into the larger programs so that students can be better trained in emergency accident avoidance. One of the life-threats that EMS and law enforcement officials face is when they respond in emergency mode (using emergency lights and siren) to an accident scene. The driving simulators allow students to experience and anticipate conditions that can lead to an accident. In one of the scenarios that instructors practiced, two vehicles are parked on the shoulder of a street that the officials are driving by to get to an emergency scene. A ball rolls out from between the parked vehicles – at first, it seems no danger to the ambulance or police car. In a split-second decision, the operator must brake for the child that will be chasing the ball, unseen to the driver. That’s one example of the heightened awareness and anticipation of the unexpected that is developed through the simulation training. These $221,000 simulators were purchased through a Community College Skilled Trades Equipment Program (CCSTEP) grant awarded to KCC from the state earlier this year. The grant allowed a one-time purchase of educational items greater than $10,000 in value to improve occupational programs throughout the state. Monies to provide a 25 percent match to grant dollars were provided by local employers. For more information about Criminal Justice studies at KCC, visit www.kellogg.edu/criminal-justice. For more information about EMS studies at KCC, visit www.kellogg.edu/emergency-medical-services.